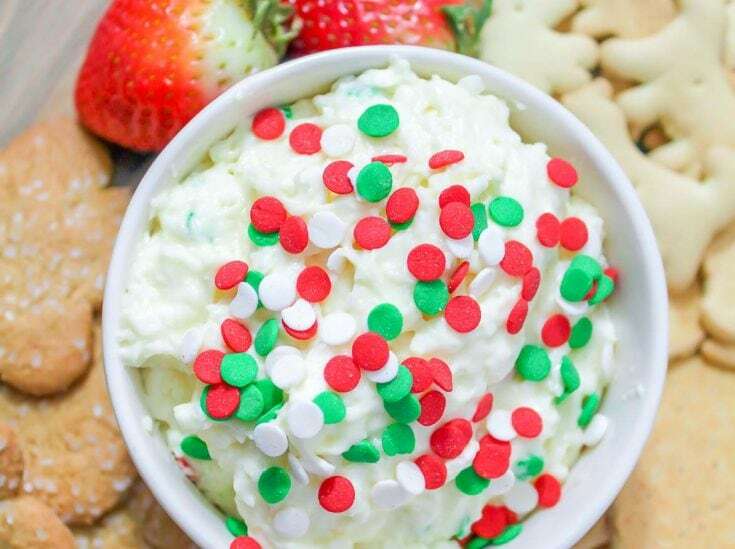 This cake batter dip with cream cheese is a fun, sweet cake mix dip that’s perfect with fruit or cookies! 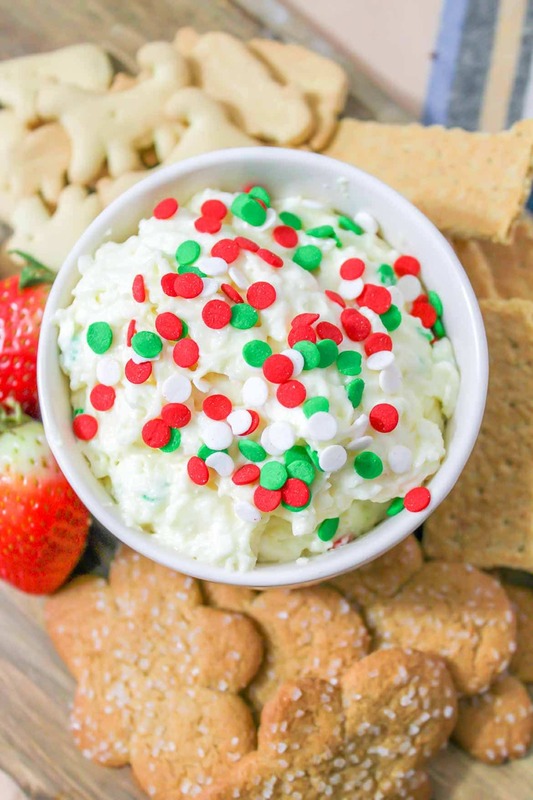 We’ve added a Christmas twist with festive holiday sprinkles on the top to make a fun holiday dip, but you could add different sprinkles and make this anytime. Just add on the sprinkles and let’s start dipping! This cake dip would be amazing paired with other dessert dips like cream cheese caramel apple dip, or a pumpkin cream cheese dip. You could even add a healthy option to this cream cheese cake batter dip with a healthy chocolate fruit dip, or a Greek Yogurt fruit dip! Now those are some delicious ways to dip a cookie or fresh fruit! While you’re at it, round out the snack table with our hugely popular easy taco dip, or this hot imitation crab dip! 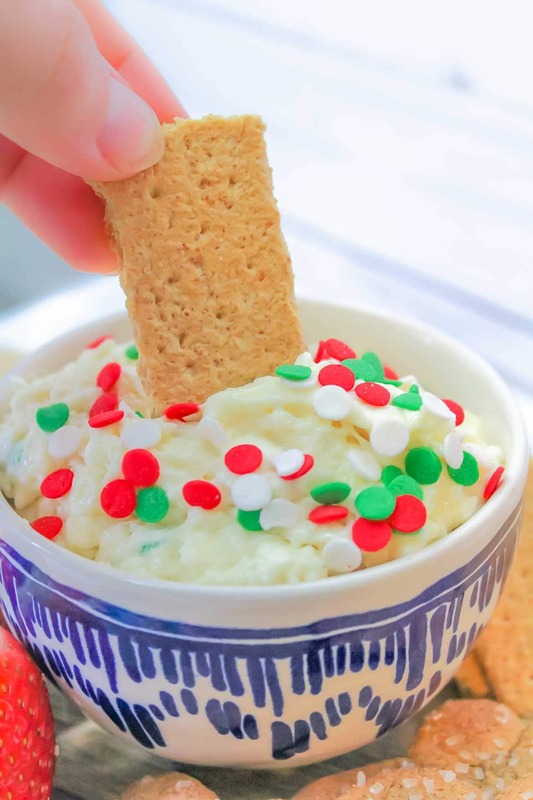 This is cake batter dip recipe is quick to put together, and only takes about 10 minutes. Just mix and serve! This post is provided to us at The Parent Spot by a guest author. Here’s what you’ll need. box white cake mix (the Betty Crocker supermoist white cake mix is amazing! Get it on Amazon now). 1/2 teaspoons cake batter flavoring. Get the classic McCormick cake batter flavoring on Amazon now. sprinkles. We like these fun Christmas sprinkles, but your imagination is really the limit. We love these animal and star sprinkles, or these bright sugar sprinkles from Wilton. 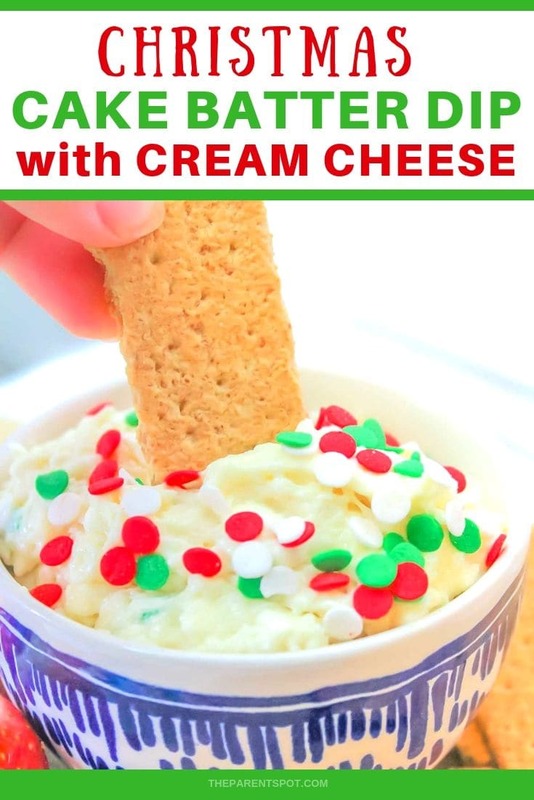 Making cake batter dip is as easy as adding a few ingredients, mixing, and dipping! First, add cake mix, cream cheese and whipped topping to a medium bowl. Beat until smooth. We use a hand mixer as it makes this dip light and fluffy, but a whisk will work, too! Add milk and cake batter flavoring and beat for 1 minute. Add to a serving dish and add sprinkles! We used fun holiday sprinkles, but you can use any kind you like! You could make a cute funfetti cake batter dip with these Wilton rainbow sprinkles. Get them on Amazon now. Serve with fresh fruit (like strawberries, bananas, and mandarin oranges), vanilla cookies, graham crackers, and gingerbread men. If you’re craving a bit of salty goodness, serve with pretzel sticks as well! Now, just dip and enjoy this yummy cake mix dip! 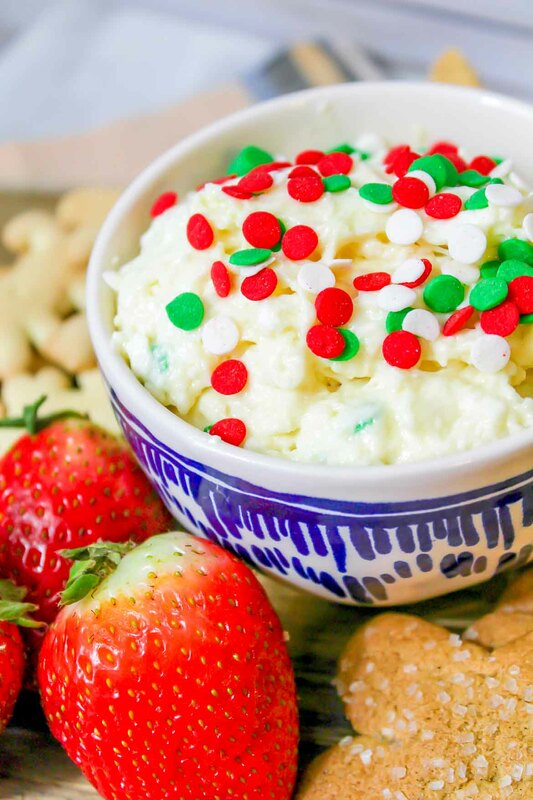 Dessert dips with cool whip are a fantastic addition to any snack table. This cake mix and cool whip dip is sure to please everyone, from kids to adults. This fluffy cake batter dip with cream cheese is made easy with a boxed cake mix. Serve with gingerbread cookies, fruit, and animal crackers and enjoy! Add cake mix, cream cheese and whipped topping to a medium bowl. Add to a serving dish and top with sprinkles! We used fun holiday sprinkles, but you can use any kind you like! Serve with fresh fruit (like strawberries, bananas, and mandarin oranges), vanilla cookies, graham crackers, and gingerbread cookies.